I know it seems like "Milwaukee Daily Train Photo" lately, but I couldn't let this one get by without mention. Saturday and Sunday, the Wisconsin Exposition Center at State Fair Park was home to the 2008 edition of Trainfest. 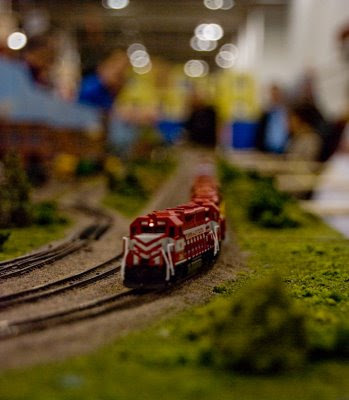 The show featured exhibits by model train clubs and vendors' areas where visitors could purchase modeling supplies, memorabilia, and art related to trains and railroading. Now this would be a fun event to attend! We played with trains all winter when I was young. I love this pic! I took my 2-1/2 yr old boy to the Railroad Museum in Golden, Co recently to meet Thomas the Train - we had a blast looking at all the miniature trains and settings. So much cooler than I expected. this is a really good picture! My boys went today with my dad. An annual tradition! Neat shot. I thought it was real.